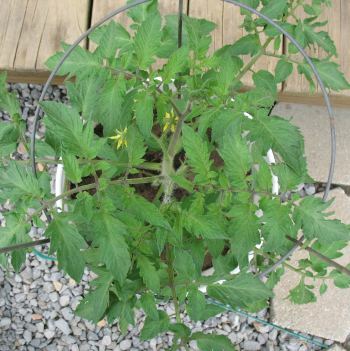 Patterings: How Does Your Garden Grow? I don't really have a green thumb, but I sense the plants have a better self-esteem when they are in bland containers. That is, they better respond to the attention directed toward them, rather than the pots! I saw a lesson in this and was surprised you didn't mention it. How we grow shouldn't matter where we are, but only if we are being fed properly. =] I knew there HAD to be a lesson in there for me,Vonnie! I missed it cuz we had a movie in while I worked on this (and there's another lesson). Thanks for pointing that out! Wow! you do have a "green" thumb! 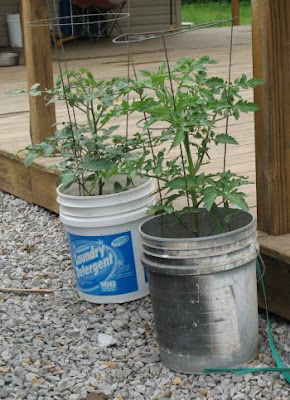 As the plants grow bigger, pretty soon you won't even see the buckets. The lush green plant and fruit will be the focus. Mom's right the focus even now is the plant and blossoms and soon the fruit. 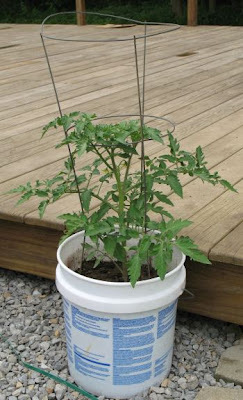 I think your tomato plants look absolutely beautiful. No complex if they outshine their planter...I see the blossoms...good eating is coming on...I have no plants yet. Tried to get dh to get me some last weekend...all I got was a look with a sarcastic-like sneer. I'll just Joyfully enJoy yours, okay?